The Downloads Addon for Envira Gallery allows you provide a download link for your images from the gallery view as well as the lightbox view. 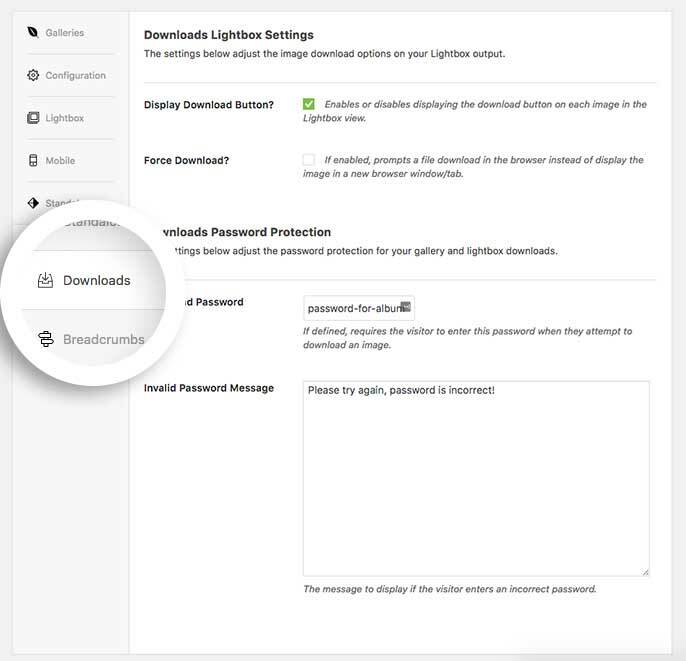 You can even use the Downloads Addon with the Envira Password Protection Addon to require a password before allowing the downloading of your images. We’ll walk you through how to set up a gallery using the Downloads Addon. Can I use a CDN with Envira Gallery and the Downloads Addon? Why is my downloads zip downloading as 0kb? Will I be able to require a password for my downloads? Can I use the Downloads Addon with albums? In this instance, you’ll be activating the Envira Downloads Addon. 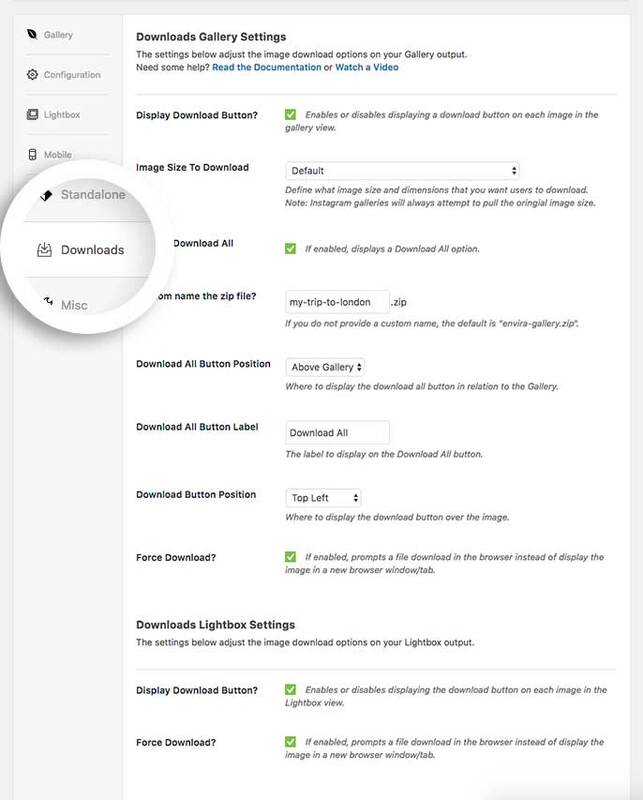 Navigate to the Downloads tab and create the settings that you want for your gallery. The list of settings available for the Downloads Addon are listed on the Downloads tab with explanations on what each option does. You’ll see an icon in the gallery view (on hover) or in the lightbox view to download the image or if you’ve enabled the Downloads All, you’ll see a link on the gallery view to download all gallery images in a zip file. Would you like to track those downloads? Take a look at our documentation on How to Track Views, Shares, and Downloads of Each Gallery Image. Q: Can I use a CDN with Envira Gallery and the Downloads Addon? A: Unfortunately, the Enivra Downloads Addon is incompatible with images served using a CDN. In order to use the Downloads Addon, all images will have to be stored in the default WordPress Media Library. Q: Why is my downloads zip downloading as 0kb? Server timeout – if there are a lot of hi-res images in your gallery it could be that the gallery is just too large for the server to handle zipping up all the images and times out in the process. The max execution time for php processing and server timeouts are set at through the hosting company. We recommend you reach out to them and ask them to increase your timeout and max execution time settings. It may be a good idea as well to ask them to check the Zip library on the server to make sure it doesn’t need re-installing. Image or images in the gallery are corrupt – if any image in the gallery is missing or corrupted, this will affect the entire download process. Server errors – you may want to reach out to our support team and ask them to further debug this issue for you. Q: Will I be able to require a password for my downloads? A: Absolutely! If you install and activate the Envira Password Protection Addon, you’ll see some additional options on the Downloads tab. Q: Can I use the Downloads Addon with albums? A: Absolutely! The Downloads tab is also available when creating or editing an Envira Album. However, you’ll only be able to download the lightbox images so the options look a little different for albums. Added: Download All link can now be displayed above and below galleries, instead of just one location. Fix: Misc fixes to lightbox downloading in some situations. Fix: Download url in lightbox for images w/ Dynamic Addon folder option. Fix: Account for https in some user cases. Fix: Download icon in lightbox with display:none inline styling now resolved. Fix: Downloads button should show after AJAX loads new page. Fix: Download links open in new windows. Fix: Resolving compatibility issues with dynamic addon. 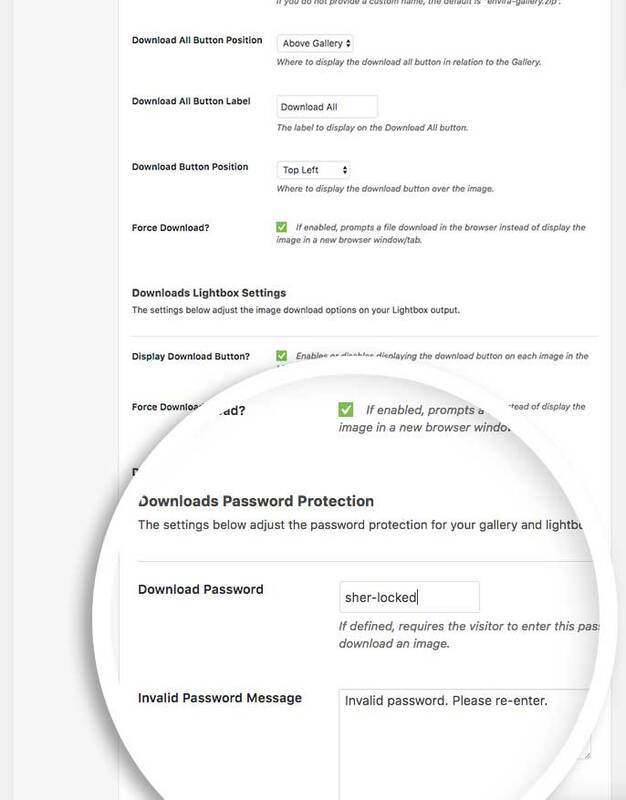 Fix: Password protected downloads should ask for passwords properly, and not allow downloads w/o correct passwords. Fix: Safari downloads all images as regular zips and not EXE files. Fix: Now functional when "Render all WordPress Galleries using Envira" option is enabled. Fix: Download button position setting now properly saves. Add an option to the Downloads Addon allowing users to download an entire Gallery as a ZIP file.